Ray Stanz, the heart and soul of the Ghostbusters, is called out of retirement when Vigo the Carpathian sets his sights on New York City and an unholy rebirth via Dana Barrett's infant son, Oscar! Ray comes outfitted in the GB2 Tan Uniform and Slime Blower harness. 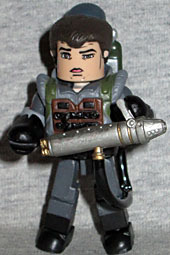 This figure is technically "Ghostbusters 2 Slime-Blower Ray Stantz," which may be the longest name any Minimate has ever had. And yes, the bio actually includes that sentence at the end, even though it's A) marketing copy and 2) not correct. He's in grey, not tan. As mentioned before, the guys only wore the dark grey uniforms very briefly, and it certainly wasn't when they were using the Slime Blowers. Ray's got a wonderfully dopey look on his face, and the rear collar of his jumpsuit pushes his hair up far enough that he actually looks like Dan Akroyd. The Slime Blower is basically a big scuba tank that takes the place of the proton pack, and has a thick rubber tube that connects it to the blower part. A tube that gets kinked. It's meant to be held in two hands, but the Minimate version is only designed with one handle. It should also have two more tubes connected to the gold nozzles at the back, so we're a good distance from screen-accuracy. You have to give them credit for trying, though. This horrific ghost appeared in Ghostbusters 2, brought back to life by Vigo's mood slime, appearing outside a theater scaring a large group of people. This Minimate's construction is very unusual: in fact, the only standard parts are the arms! It's built from Sandman's lower body, Wasp's wings, a narrow torso block that gives us four arms, shoulder-flames, clawed hands and a tall head. 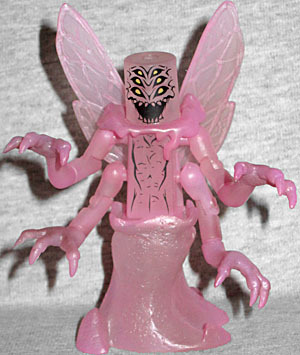 It's all translucent pink, with paint on the chest and face to make it more monstrous. Of course, the ghost in the movie didn't have legs or wings, but consider those pieces an attempt to capture the wispy smoke around him. The theatre ghost's role in Ghostbusters 2 was pretty much the same as the Subway Ghost in the original: burst out of an off-screen location, scare a bunch of people, and then zoom off into the night. The theatre in question, by the way, was the Movieland near the corner of Broadway and 47th St., which closed in 1989 and is now a deli. I guess you should have gone earlier, while you still had the chance! This entry was posted in Art Asylum, MMMR and tagged Ghostbusters. Bookmark the permalink.